The creature comes barreling down a narrow web-choked hallway in the enemy wizard’s fortress. The ground shakes as the large humanoid stomps towards our hapless adventurers. Its fists like cudgels and its door-shattering shoulders wide and powerful. Its feet and legs like dreadful stumps ready to stomp our heroes into pulp. Snickering behind the monster is the wizard who created it and ordered it to slay his enemies. This is a golem; an artificial creature shaped from clay, chiseled from stone, or hammered from iron by a powerful wizard. It unwaveringly obeys every order that its maker gives it. 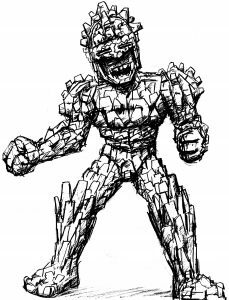 The golem is another staple of the fantasy roleplaying game used mostly by mages in game as a minion to account for their own physical weakness or set as a powerful guardian against adventurers and the like. Similar to other entities and beings considered classic archetypes of the RPG genre, the golem has roots just as deep if not deeper. The adaptation of the golem into RPG’s was probably inspired by the pop-image of the creature, which first hit the popular imagination with the silent film Der Golem (1914), a partially lost classic of the horror genre. Of course, the filmmakers were themselves inspired by a medieval Jewish folktale. This folktale, known as the Golem of Prague, has its clay feet planted firmly in biblical and Jewish lore. All the sources that I’ve encountered also concede that a golem is not technically living although it may be semi-autonomous able to carry out simple commands it is still not technically living. Therefore, most things that affect living beings such as death effects, poison gas, as well as most non-magical attacks (this last one does vary although a semblance of it is retained in most instances), do not affect them. It is also a mindless object in the most basic sense and thus cannot feel fear or fall victim to psychic attack and psychological warfare. Therefore, a golem is a magical construct given animation by a powerful spell-caster through a ritual that binds a spiritual force to an artificial body making it strong, durable, and immune to certain attacks and special modes of combat typically effective against living intelligent beings. Essentially, a golem is the most basic example of a magical construct. The term magical construct can also apply to animated objects like statues and armor although this effect can be achieved in many games with simple spells with lesser power than for a golem. These would come about in a fashion more akin to standard magical items. However, a measure of power is still required similar to a golem. Now what is a construct since a golem is also defined as a magical construct? Essentially a magical construct is a magical device that mimics the most basic features of a living being barring reproduction. However, how does a magical item pull this trick off? A wizard cannot just conjure a soul out of nowhere and infuse it into the artificial body (the construct) so a readily available substitute is required. This substitute for the soul came in the ancient lore from the secret name of God and the creative power of the Hebrew Alphabet. In RPG’s which draw on a very rich and deep reservoir of world (though still mostly Western European but expanding) mythology and ancient lore another source is found in the form of errant elemental spirits. Therefore, a golem so far is a magical construct that lacking a soul to grant it authentic life mocks the semblance of life using a trapped elemental spirit instead. The materials of the constructed body can be just about anything but tend to have a relationship to the earth in most versions but is probably not a necessity. This maybe stemming from the creatures originally being sculpted from clay. The magical process to create such a constructed creature lies within not only Jewish lore but primarily seems related more to the old silent films. The golem as a creature has beginnings in certain biblical and mystical passages and works. The idea of a powerful artificial person was a common one in ancient times and became more widespread with the middle age folktales that draw on these sources especially when the European Jews suffered brutal oppression at the hands of their fellow countrymen. There are commentaries to the Sefer Yetzirah, the Book of Creation the most influential book of the Ma’asei-Bereshit mystical tradition written sometime between the 3rd and 6th centuries, which claims that biblical figures made golems. Up to the middle ages, there were multiple tales of Jewish figures attempting to or creating golems for various reasons. The Spanish philosopher and poet Solomon ibn Gabirol (ca. 11th century) is credited by Jewish occult tradition with creating either a female golem or a mechanical automaton. [Dennis. P.164] It seemed that creating a golem was a common ability in occult accounts and especially in certain medieval stories. This brings us to the most common use for golems, guardianship and protection especially emphasized in the middle age folktales. The middle ages for European Jews were sometimes exceedingly bleak. This is the time that the most well-known and popularized myth of the golem originated when scattered throughout Europe Jews became victims of severe religious and economic oppression. Some brief examples of the ultimate results of this oppression being the Rhineland Massacres of 1096, the 1190 York Massacre, and the Black Death Persecutions from 1348 to 1350 to name just a few. The story of the Golem of Prague concerned the famed rabbi Yehuda Loew of Prague (1512-1609) who was a renowned scholar of the Torah and the Talmud, a gifted storyteller, an eminent scholar, and could speak several languages fluently. One night he had a vivid dream. In this dream, he found himself in the Christian quarter of the city and there to his horror he witnessed the murder of a child. Then the shadowy form of the killer took the little corpse, placed it in a sack, and left it in a cellar in the Jewish ghetto. As the shadowy murderer passed by him, the rabbi recognized it as the priest Thaddeus, an evil clergyman determined to destroy the Jews of Prague. With the festival of Passover fast approaching, it would be the Jews that would be blamed. Understanding the hideous implications of this horrible action, the rabbi prayed for help. The answer was immediate. In his dream, he saw the sacred name of God and a formula of mystic words that would help him create a golem out of clay who would destroy the enemies of Israel. He awoke suddenly covered in sweat. Taking the message of his dream as prophecy, the rabbi went to the banks of the River Moldau. There he shaped a man of immense size and when all was completed to his satisfaction, Rabbi Loew took from his pocket a piece of parchment. On this parchment, he had written the secret name of God and placed it in the mouth of the cold gray figure. He began chanting a mystical incantation while walking around it seven times one way and then seven times the opposite. With Joseph at his side, Rabbi Loew found the murdered child hidden in an abandoned basement in the house of a pious Jew. He had Joseph transfer the body to the basement of Thaddeus’ house. When the authorities came to the old man’s house, the rabbi directed them to the priest’s home where they discovered the body to the priest’s surprise thereby sparing the Jews of Prague. Later, Joseph would also protect the rabbi’s people against a pogrom imposed by Rudolf II the Hapsburg Emperor (1552-1612). His work done the rabbi allowed the golem to rest on the bench in front of his house where the rabbi’s wife, Perele set him to hauling water. The rabbi had warned her previously that Joseph should not do household chores. Like a holy vessel, he was meant only for God’s work. Regardless, she set him to his task, hauling water buckets from the well to fill the barrels in the pantry while she went to the market. A few hours later she returned with her shopping and was surprised by a crowd of her neighbors gathered about her home shouting, “it’s a flood!”. The pantry barrels were filled to overflowing yet Joseph did not stop. He kept running to the well and filling his buckets and then ran back to the pantry to continue to fill the overflowing barrels. It was at that moment, by good fortune, that Rabbi Loew returned from synagogue and ordered Joseph to stop. Then the rabbi turned and told the crowd that the floods had been sent to punish mankind but this had only been a reprimand to his wife. It is probably this story that inspired the filmmakers to make the movie Der Golem, which no doubt played a critical role in popularizing the myth. High Rabbi Loew sees in the stars that danger impends for the Jews of Prague. Instantly a flower-sniffing Junker arrives with a decree from Emperor Ludwig: leave before the end of the month. Loew consults his ancient archives. This is important not just from the establishment of a process of creation that can be adapted for RPG play, there are many different ways in Jewish occult lore to create a golem however all revolve around God, but it also establishes the power of the magic-user. This spell is a Level 13 spell in the Palladium system, which as legend would indicate a powerful spell requiring a skilled and powerful mage to create a single golem. From the moment it entered the popular imagination through film, the concept begged infusion into the fantasy RPG realm. This concept being of an unquestioning minion with a physical might that more than compensates for its master’s physical weakness as well as a simple guardian type monster. This idea retains a little of the golem’s purpose of protection and the idea that a powerful magic-user can create an artificial life. In a sense, the mage through the creation of a golem is trying to attain the elevation of a god. 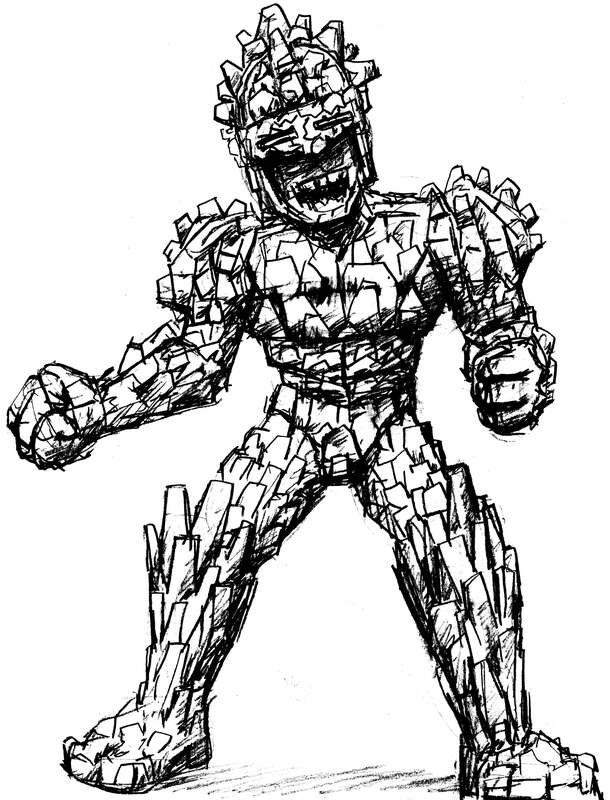 An RPG golem is an animate, semi-autonomous magical construct created for the purpose of guardianship or protection through its shear might. These creatures are created by powerful wizards or those privy to powerful magical knowledge. The ritual and method that is used to create them is varied almost as much as those found throughout their history in story and myth. They often lack the ability to speak and to think for themselves though they can understand, follow, and execute their master’s orders. However, it seems that most RPG’s don’t take advantage of the dangers posed by a golem found in lore where they can grow dangerously independent of their masters and increase in power and size the longer they live. They may still be very physically powerful and difficult to procure but they seem to lack the unpredictability of legend. RPG Golems began as a demonstration of faith and power in Jewish occult tradition, became figures in folktales in the middle ages which spawned the seminal tale the Golem of Prague, which was adapted into a silent film in the early 20th-century. This film helped to popularize the idea of the golem as a magical servant/protector that then in turn was adapted into the world of RPGs. On a final note since RPG golems can be made of many different materials not just clay, stone, or iron but also flesh. These flesh golems should they retain the rebelliousness of the legendary golems have more than a passing resemblance to the monster in Mary Shelley’s Frankenstein.